I'm always a bit late (try half a year late) on posting collections that I'm in love with, but a lot of times I forget to check up on them. But, I've been thinking about Orla Kiely's F/W '13 collection for quite a while now, because it is too perfect! Firstly, I'm so glad Antonina Vasylchenko is one of the models for the collection, because she is one of my favorites and I think she is so gorgeous. But, as for clothes, Orla Kiely has one again nailed it. I love that brocade patterns are still in for this fall and winter, because last year I couldn't get my hands on anything brocade! But this year I'll make sure to keep an eye out for some lovely brocade dresses or anything else brocade really. 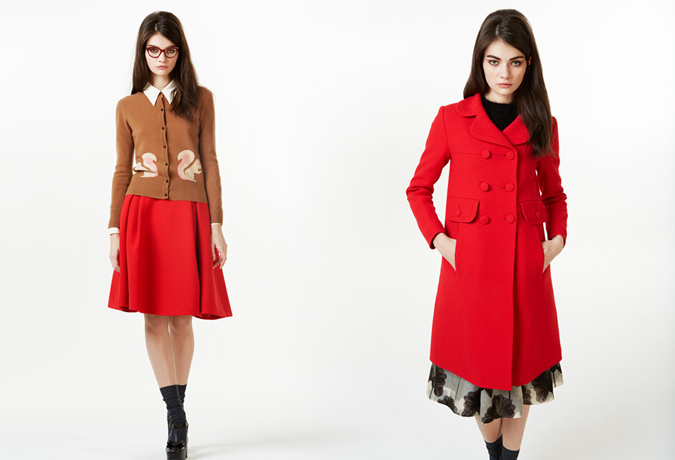 But yes, I love this collection so so much, just like every other Orla Kiely collection. What do you think of it? Hope you have a lovely day! PS- From now on, I will try to stay on track of posting nice collections and lookbooks straight when they come out, haha! I love this entire collection- so many beautiful colors for fall! a little old school but still nice! This is just great for autumn + it really matches your style!